I’m very glad to announce that I will be speaking at the Collab365 Online Global Conference taking place on (Oct 7th/8th). 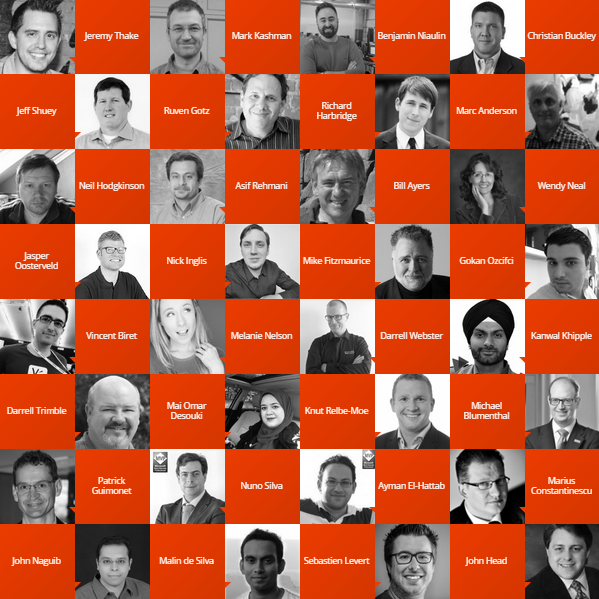 24 Hours of Office 365, SharePoint, Azure and more!! This is the event for 2015 if you want to gain in depth insights from experts all over the globe. Whether its the technology that you want to learn about, the applications or the implications of using Office 365, SharePoint or Azure, it’s the right event where you will find answers. Here are just some of the speakers who we have been able to fast track into the line-up. Over 60 sessions in 2 days (June 17th & 18th 2015), SPBiz Conference is bringing insights and knowledge to help your business benefit from SharePoint, wherever you are. 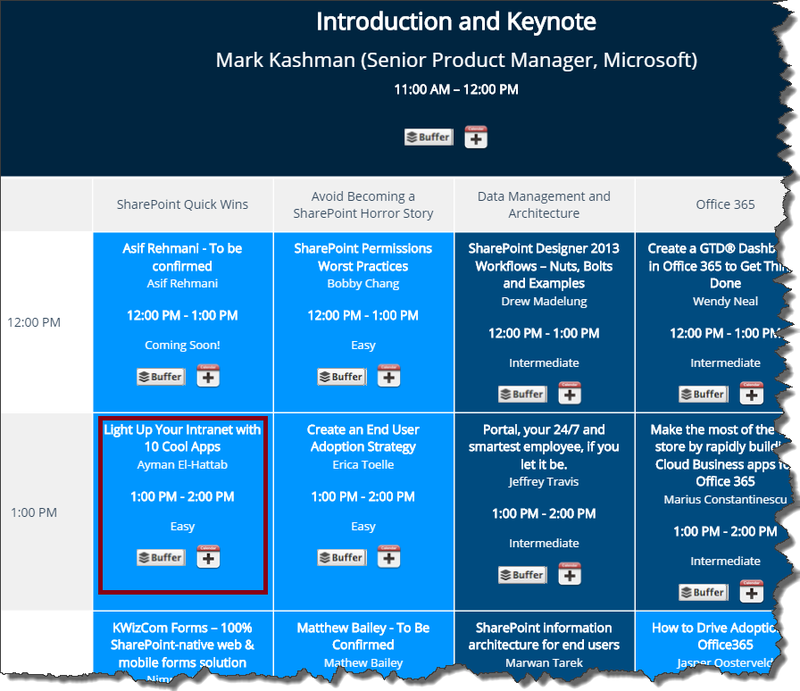 If you want to get the most out of your SharePoint platform, this is conference is for you. Free to attend as a delegate, bringing influential speakers and direction setters in the SharePoint community directly to your device. Description: SharePoint is the intranet platform of choice and one of the most commonly-used tools of organizations. Users uses Intranets to find the information they need to perform their day-to-day functions, from HR to Help Desk Wikis to Travel Request forms, and much more. Attend this session to discover 10 cool SharePoint / Office 365 apps (Add-ins) that can be used to boost team & personal productivity, help your workforce cut back on meetings and email chains and get the different teams within the organization to work together in flexible and collaborative workspaces to get things done wherever, whenever. More information about my session here. Please note all times are shown in EDT. Automated Testing Challenges for SharePoint Apps – Assigning the Latest Build to the Current Test Plan! During my SharePoint Conference session (SPC273 : Application lifecycle management in Office and SharePoint), I showed the audience how simple it’s to automate the process of building, packaging & deploying SharePoint apps by creating very basic Team Foundation Server Build Definitions. I’ve also quickly touched upon two challenges that architects and developers usually face when trying to add Automated Build Verification Tests (BVT) to the process & hence reaching a fully automated continuous deployment process. The SharePoint App should be manually trusted before any manual or automated testing take place. From Microsoft Test Manager & before any automated test cases are executed, the latest build should be manually assigned to the test plan containing those test cases. I’ve explained the first challenge along with a trick that you can use to eliminate the manual step needed in this post. Today, I’m going to explain the second challenge and show you how to handle it. If you are using Microsoft Test Manager for testing, the “build in use” field within the Test Plan should be updated to use the specific build that your testers are going to test. As you proceed with testing, you might find bugs. Those bugs should be logged against a specific build for traceability & reporting reasons. For more info, please check this article. Before automated tests are executed, Microsoft Team Foundation Server copies the Test Automation assemblies from the drop folder of the assigned Build to the remote testing environment where test cases would be executed. I’ve written a post and recorded a quick video last year to show how and where those DLLs are copied, you can check them out from here. Unfortunately, There is no option out-of-the-box to automatically update the “Build in use” field to use the latest build. This means that after the SharePoint App is built, packaged, deployed & trusted, you still need to pause the testing efforts, go to Microsoft Test Manager and update this field manually to use the latest build. In case you want to add Automated Build Verification Tests (BVT) to your build definition, you will need to find a way to automate this task and that’s exactly what we are aiming for; a fully automated continuous deployment and quality assurance process. Create a console application that uses Team Foundation Server API to retrieve the latest successful build and then assign it to the current test plan. Call the console app from within your build definition (After the app is built, packaged, deployed and trusted and before test cases are executed). How can I create the console application? Here is some code that you can use. The code is self explanatory. Where should I deploy it? I usually copy the output .exe to my testing environment. You can copy it anywhere, just keep in mind that it should be executed on a machine with ‘at least’ Visual Studio Team Explorer is installed. How can I call it from the build definition? Copy the .exe to the testing environment. Call the Console Application after the app deployment (and trust) take place and just before test cases are executed. Once the console application is called, the “Build in use” field is updated, the latest & correct Test Automation assemblies are copied to the remote testing environment, the test cases are executed on the latest build, and the results are published and reported against it. To complement my #SPC14 session, I’ve recorded a 25-min video to show how to create a fully automated continuous deployment process for SharePoint Apps (Build – Deploy – Trust – Test – Report). The two challenges are handled in the video, you can watch it from here. [SPC14] Application Lifecycle Management in Office & SharePoint – Slides, Recording & a Complementary Video! I’m extremely happy to announce that my session (#SPC273) from the SharePoint Conference 2014 (#SPC14) on “Application Lifecycle Management in Office and SharePoint” is now available on Channel 9. This means that now you can view the slide-deck, download it or download the full session recording. 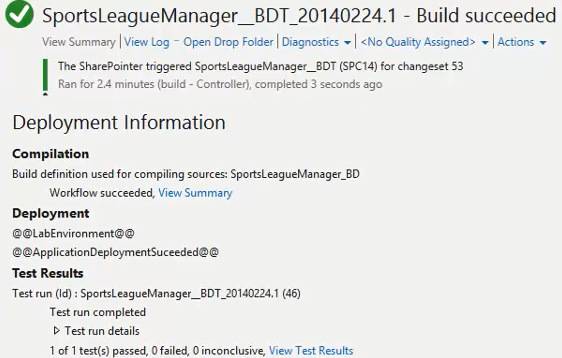 To complement my SPC14 session, I’ve recorded a 25-min video to show how to create a fully automated continuous deployment process for SharePoint Apps (Build – Deploy – Trust – Test – Report). I’ve quickly explained the theory in the session but I didn’t have time to show the full process, so I highly recommend that you watch the session first before watching the complementary video. Note : You might also want to check this blog post (Automated Testing Challenges for SharePoint Apps – Trusting the app!) for additional details about the App Trust workaround! 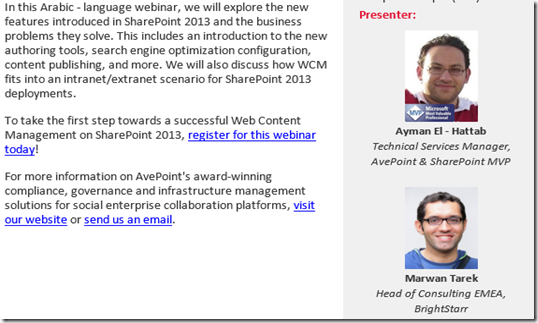 while Reducing Storage Costs – Arabic, where AvePoint will discuss strategies and help you learn more about how to manage your SharePoint environment to ensure top platform performance and productivity.Register today and join us to learn more. Meet AvePoint, the leader in governance, compliance, and management solutions for social enterprise collaboration platforms. As a technology company, collaboration is the fundamental channel of information, creativity, quality products, intellectual property, and even community presence. It has been the lifeblood of our company in moving from two founding employees to more than 1,300 employees worldwide. Have a look at our brochure for more information on AvePoint in the Middle East. For more information, please visit www.AvePoint.com . Some folks have asked me about the agenda for the upcoming Migration webinar which I’m delivering on Tuesday 28th and whether I’m planning to show real-life migrations. This post is to answer those questions.. Looking forward to “virtually” meeting you ..